The Laboratoire International Associé between the Centre National de la Recherche Scientifique and the University of Illinois at Urbana-Champaign was launched at the end of 2012. Its primary objective is to develop methods for high-performance molecular simulation with the aim of understanding the function of complex biological assemblies, transcending the frontiers of traditional disciplines by uniting mathematicians, physicists, theoretical chemists and biologists on both sides of the Atlantic. In France, the major contributors are located at the Université de Lorraine, the École des Ponts ParisTech, the Institut de Biologie Structurale and the Laboratoire de Biologie Physico-Chimique. In the United States, the contributors belong to the NIH Resource for Macromolecular Modeling and Bioinformatics. 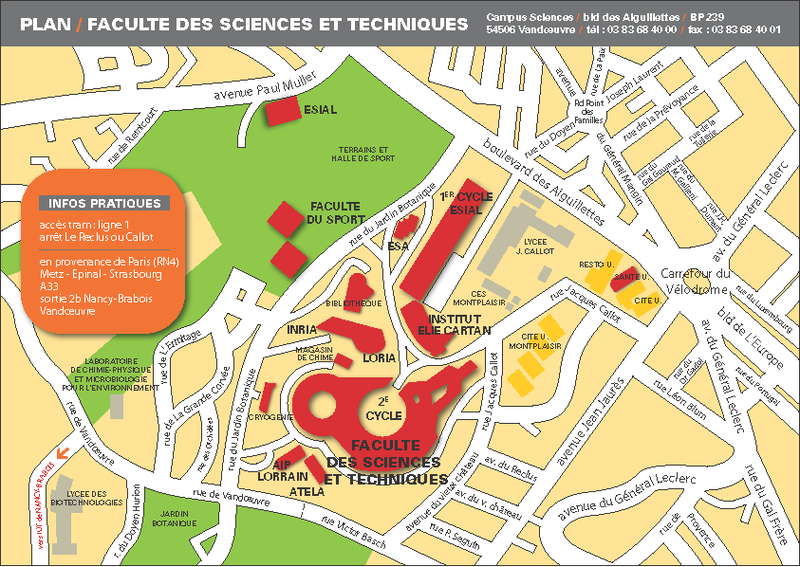 In Nancy, the partner is a theoretical chemistry and biophysics group incepted in 2003. Its expertise lies in describing the structure and the dynamic properties of the biological membrane and elucidating the mechanisms of the cell machinery. To attain this goal, its members leverage numerical simulations over size and timescales commensurate with the biological process at hand. Over the years, the team has gleaned milestone results in such diverse research areas as membrane transport, interaction with the biological membrane, membrane protein structure and function, as well as self-organized molecular systems. They also develop original approaches in the field of free-energy calculations to tackle rare events in biology. BFEE: A User-Friendly Graphical Interface Facilitating Absolute Binding Free-Energy Calculations. Quantifying protein−ligand binding has attracted the attention of both theorists and experimentalists for decades. Many methods for estimating binding free energies in silico have been reported in recent years. Proper use of the proposed strategies requires, however, adequate knowledge of the protein− ligand complex, the mathematical background for deriving the underlying theory, and time for setting up the simulations, bookkeeping, and post-processing. 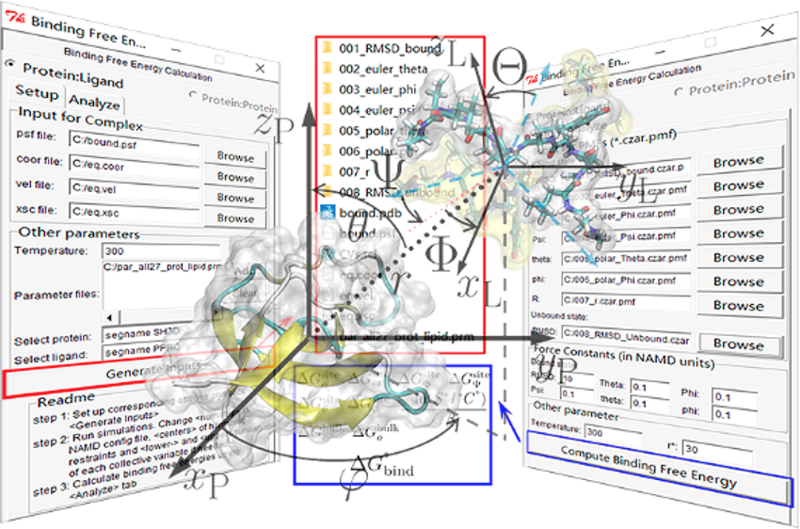 Here, to minimize human intervention, we propose a toolkit aimed at facilitating the accurate estimation of standard binding free energies using a geometrical route, coined the binding free-energy estimator (BFEE), and introduced it as a plug-in of the popular visualization program VMD. Benefitting from recent developments in new collective variables, BFEE can be used to generate the simulation input fi les, based solely on the structure of the complex. Once the simulations are completed, BFEE can also be utilized to perform the post-treatment of the free-energy calculations, allowing the absolute binding free energy to be estimated directly from the one-dimensional potentials of mean force in simulation outputs. The minimal amount of human intervention required during the whole process combined with the ergonomic graphical interface makes BFEE a very effective and practical tool for the end-user. Journal of Chemical Information and Modeling, 2018. - New NAMD tutorial for the computation of standard binding free energies. - New NAMD tutorial for free-energy calculations along a minimum-action path. - An update of ParseFEP is available in the latest version of VMD. - AlaScan : a new VMD plugin for alanine-scanning free-energy calculations.